SAVE A MOUNTAIN OF DOLLARS ON THIS LOG HOME! 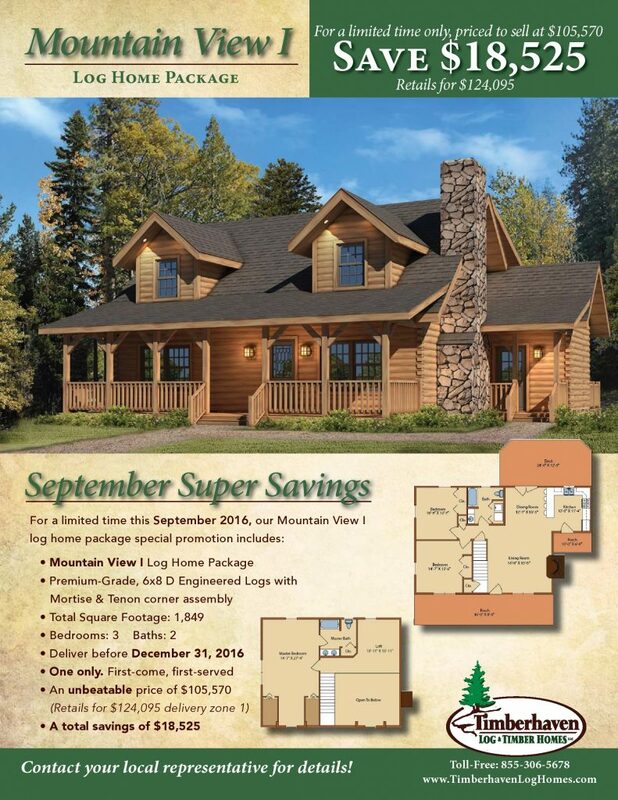 Home→Announcements→SAVE A MOUNTAIN OF DOLLARS ON THIS LOG HOME! All of us like to save dollars, right? Well, how would you like to save a “mountain” of dollars on a new log home? If you think we are joking, keep reading because it is not a joke! We have substantially reduced the price on one of our Mountain View I models and it is available this month on a first-come, first-served basis, at a savings of $18,525. This Mountain View I is constructed with Timberhaven’s 6×8 D Engineered Logs that come with their Limited Lifetime Warranty, and has mortise and tenon corners. At a total square footage of 1,849sqft, there is plenty of room for family and guests with its 3 roomy bedrooms, 2 full baths and its large Living/Family Room with provision for a fireplace. Now, imagine sitting in that Living Room, enjoying a nice fire in the fireplace and watching it snow through the windows – what can be more relaxing than that? So, do not delay. If you are in the market for a log home and want to save a “mountain” of $$$$, now is the time to contact Morningdale Log Homes via our Contact Form below, Email, Skype or by phone at 814-967-2206 and find out more about how we can help make your log home dream become your dream log home! Save a “Mountain” of dollars this month!